Preheat oven to 160ºC or 150ºC fan forced. For persimmon puree, remove calyx and scoop pulp out with a spoon. Discard skin and seeds, then blitz pulp with a stick blender or blender to make 1½ cups of puree. Set aside at room temperature. For the cake, with a pastry brush, thoroughly grease ring tin with melted butter. Spoon a couple of tablespoons full of plain flour into tin, turning and shaking it until the inside is completely coated. Bang tin firmly on bench top to loosen excess flour, then discard. With a whisk, roughly mix all the wet ingredients and sugar in a medium to large bowl. Fold dry ingredients into the wet mixture in 3 to 4 batches until you have a relatively smooth batter. Pour into the ring tin and bake for 50 mins to 1 hour, or until skewer comes out clean. Allow cake to sit for a few seconds before turning out onto a cooling rack. To prepare icing, combine all ingredients and cream with an electric mixer until pale and fluffy. 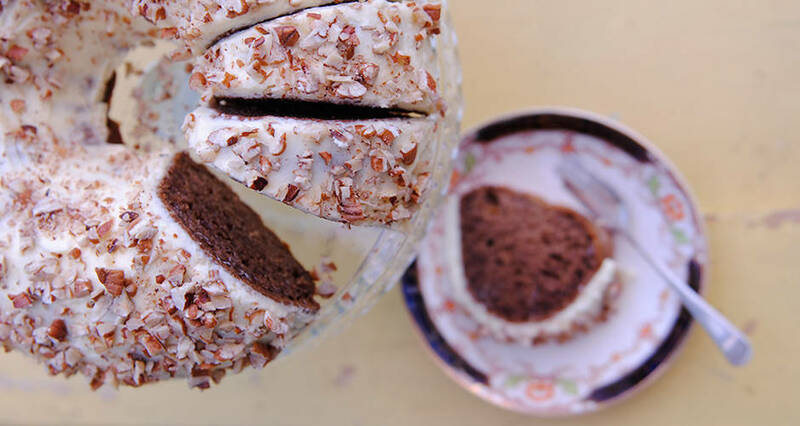 When cake has cooled completely, slather roughly with cream cheese icing and sprinkle nuts over the top. Note: To toast pecan nuts, simply chop roughly and then dry toast in a frypan on a medium heat until nice and golden. You may also roast in a pre-heated oven at 160ºC for 5 to 10 mins. Cool before using.